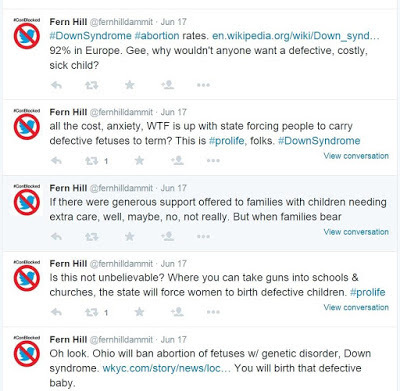 BIG BLUE WAVE: Pro-Abortion Blogger Calls Down Syndrome Children "Defective"
Pro-Abortion Blogger Calls Down Syndrome Children "Defective"
Anonymous blogger and abortion activist Fern Hill calls Down Syndrome Children "defective". In the next she says individuals with Down Syndrome can be lovely. (see http://tinyurl.com/o68lbah). And yet she sees no contradiction! Completely un-self aware of how disdainful she is of people with Down Syndrome, reducing their worth to their "fitness". Yes, those people are lovely. But defective. The eugenic mentality does that. It makes you measure a human being's worth by their physical qualities. But don't tell Fern Hill she shares that mentality with the Nazis. That's "going Godwin." No analogy to be made whatsoever!